Hello. Welcome to Prestige Storage’s online store. It’s a pleasure to meet you. Thank you for your interest in our organisation, products and services. Since 1988, Prestige Partitioning and Storage Systems Ltd has worked within the commercial interiors and material handling industries, serving hundreds, if not thousands of clients in diverse industries. We’ve helped businesses across the UK to boost productivity and efficiency with effective space planning. Our wealth of experience and high-quality products are the reason our customers choose us. We deliver an excellent professional service that’s been nurtured for over 30 years. We’re based in Ilkeston, Derbyshire, just off junction 28 of the M1 - serving businesses in Nottinghamshire, Derbyshire, Leicestershire, and the wider UK. We build lasting relationships with a large proportion of our clients, with some of them being on our books from the very beginning. Why do they come back? Well, we’re here to help your business grow and when it does, because it will, we’ll be here to help further develop your systems and supply ancillary equipment to make it work better than ever! Our staff have accumulated over 100 years in the industries we serve. All our sales team come from a technical background and know the products/services we supply like the back of their hands. It’s thanks to your guys, though, that we have such a good company. Your feedback has helped us develop the business and take it further than we ever imagined. Our technical team can make space work for you, there’s no simpler way of saying it. 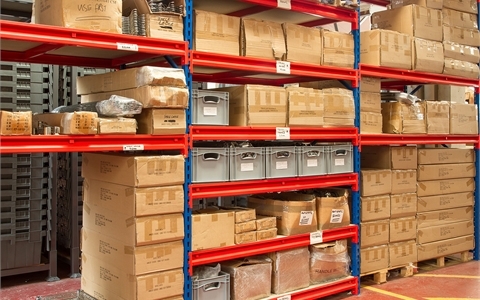 From racking and shelving to office partitioning and mezzanine floors and everything in between, we’ve got you covered. More recently, we’ve launched an online store, jam-packed with all our high-quality equipment. You can now; see our offers and discounts; purchase essential equipment at the click of a button, and most of all enjoy our online experience. Don’t worry about contacting our sales desk (sales@prestige-storage.co.uk), you won’t be hounded by salesman – you’ll be welcomed by our lovely team, who are more than happy to help supply you the best products on the market! We work on your behalf, it’s our job to learn about your business and the best solution for it because it’s in our interest as well as yours to get it right. We’re all passionate about what we do, and we’ll look forward to hearing from you. Do you want an efficient warehouse and a stylish office? Tell us about your project(s) by clicking here.